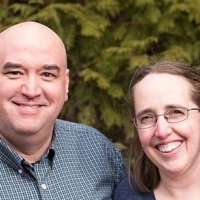 Mary and her husband Chris have been a part of North Bay since its beginning when they joined a Bible study that was the core group that planted our church. She worked as a volunteer doing the church bookkeeping until 1998 when their first child was born. She returned as an employee in 2002 managing church finances, reports, mailings, and communication with ministry leaders and church elders. Mary is an avid enthusiast of books (especially mystery), board games, card games, cooking, baking, and canning. She has a second job working evenings and weekends and is a full time wife and mom to an amazing family. And while she's done just a little bit of sewing and crocheting, she would love to one day add these talents to her "free time" activities.